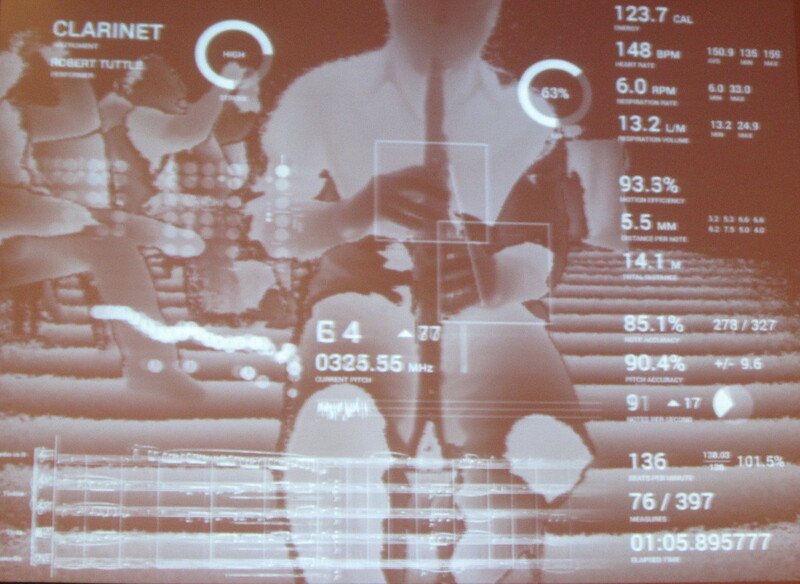 Acoustic quantification combines datasets from physically playing an instrument with time, frequency, dynamics etc. into a singular format. “Ultimately I’m trying to get you to understand what it takes to produce music on all fronts,” emphasized Tuttle. To do this he utilizes two upcoming tech innovations: an indiegogo campaign called Hexoskin, and Microsoft’s Kinect 2, which is set to release in December 2014. While the Hexoskin vest gathers data on respiration patterns and other vitals, the Kinect 2 tracks motion, noise and frequency patterns. Together they come together as a beta acoustic quantifier. Acoustic Quantification picks up and analyzes data as Robert Tuttle plays the clarinet. To track motion, Tuttle prefers the Kinect 2 because of how crucial its 3x depth fidelity is, as well as it’s improved 25-point skeleton that can track up to 6 people simultaneously. It also provides greater noise isolation, vastly improved tracking and provides depth, infrared, color and coordinates of the body for the quantifier. Acoustic quantification would be extremely beneficial in a private lesson setting by detecting stress, excessive force exerted, or low-quality air flow. On a larger scale, quartets and even entire orchestras could be quantified in real time as they perform. The Hilton Hotel hosted an Ireland-exclusive start-up expo called NASDAQ and Ireland @ Start Up Village. 12 startups pitched to a guest panel of several influential tech entrepreneurs. 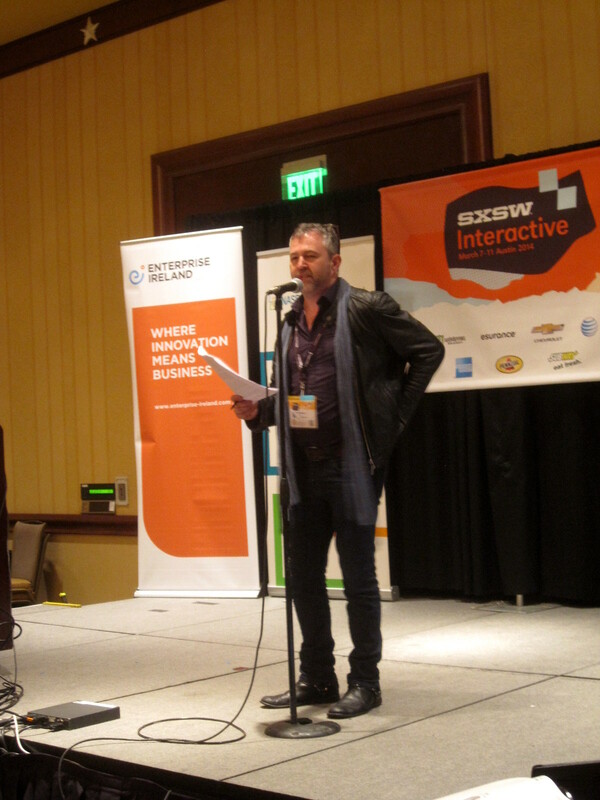 Moderating the event was TechCrunch’s Editor-at-Large Mike Butcher. Presenters included ViddyAd, LumaFit, Shimmer, TrakAx, Tapastreet, BetaPond, The Steam Group, FRAGD, voxpro, evercam.io, journ.ie, and Good Travel Software. All of these were very engaging and exciting startups, many of which I hope become bigger in the few years to come. Forbes Magazine has recently ranked Ireland as the best start up ecosystem in Europe, and this expo was a great example why. Wearable Computing: Now, Near & Next Generation was a four-person panel conducted by Switch Embassy CEO Alison Lewis, 4A’s Chief Digital Operator Chick Foxgrover, 22squared’s Counsel of Advertising & Intellectual Property Gill Segal, and Greylock Partners Technologist Sean White. While new classes of digital objects are emerging in the form of wearable tech, the idea of wearing powerful objects has always been a concept since the beginning of time, said Foxgrover. The difference between wearing and using an mobile phone is that wearable tech will solve our problem of having to look down at our phones all of the time, and free us to engage more freely in our environment. Taking us into a fashion perspective, Lewis introduced the TShirtOS, a washable, wearable shirt with an LED front you can control and customize through a phone app. “If you’re in the mood for Shell’s logo and then Nike’s logo next,” Lewis said, “it’s possible to do.” The ability to customize logos and designs on a t-shirt lead to an interesting discussion about intellectual property in the wearable tech age. Foxgrover asked the panelist where wearable tech needs to go in order to increase desirability among the general public. The consensus was that the tech and fashion world need to work together to satisfy function, aesthetics and expression. Segal said that, in order to fully integrate into society, wearable tech needs to be incorporated in our lives beyond active function and into passive function. While Google Glass is a pioneer of both glanceable technology and the emerging micro interactions market, it’s also the poster child of impending privacy and data concerns while you’re out in public. As the Internet of Things continues to expand, privacy concerns will not going away anytime soon. In order for society to be fully on board with this new wave of technology, both fashion and tech industries must address how data is being used and establish a relationship of trust and respect for privacy for the consumer. Stay tuned for SXSW Day 3 – 5 coverage!